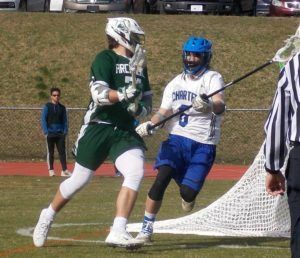 Archmere seniors Mitchell Moyer, Cole Bauer, and Brian Neill each scored hat tricks as Archmere powered past DSAC rival Wilmington Charter 15-1 in boys lacrosse on Thursday, March 28. The Auks had a 4-1 lead after the opening quarter, and kept the momentum up throughout the game. Archmere improved to 3-0 and hosts its home opener on Tuesday at 3:45 p.m. against DSAC foe First State Military Academy. For pictures and full game details click here. Mitch Moyer '19, Photo Courtesy of Mike Lang, "The Dialog"
A private, Catholic, college preparatory co-educational academy, grades 9-12 founded in 1932 by the Norbertine Fathers.